Jaron Lanier, a pioneer of Virtual Reality, takes apart Web 2.0 mentality and launches an attack on the internet, computing and a culture of gadget fetishism that is driven more by fear than love of technology, in his book You Are Not a Gadget. Proponents of Web 2.0 talk about the powers of collective knowledge construction but the reality is not always borne out by the facts. Lanier describes this emergent line of thinking as the noosphere – a global brain formed by the sum of all human brains connected through the internet. Lanier basically suggests that to enter a new era of creativity & innovation we need to kill the ‘hive’ mind (noosphere, echo chamber) that is web 2.0. The thing that both Shirky & Lanier assume though is that people actually want to contribute – the reality is that often they don’t. We talk about Twitter and PLN’s and all the wonderful sharing, but we are caught up in this concept of the ‘hive mind’ or ‘echo chamber.’ We only need to look at the #commentsforkids and all the coercion that people engage in to artificially produce an audience for students. From my own experience I would even go as far as suggesting that the idea of cognitive surplus may be nothing more than an idealistic, utopian fantasy – at best a moot point that relies on intrinsic motivators for participation. For instance, my Games in Education wiki – 187 members and only one has made a contribution. This is ok because I really only use this space to collect interesting research and information about games and GBL – it’s a public/personal space for me as opposed to being a space for collective knowledge construction (which is how a wiki is supposed to operate). This lack of interaction isn’t restricted to this wiki however – being a moderator of various online communities of both adults and children, with memberships ranging from 3500 to 200, some people actively participate more than others. Researcher Jakob Nielsen calls this “Participation Inequality“. 90% of users are “lurkers”. These people tend to read or observe, but don’t actively contribute. 9% of users contribute from time to time. Lanier got me thinking about the motivations of people and in particular the study of Game Theory and how this can be applied to the situation. In game theory, Nash equilibrium (named after John Nash – think A Beautiful Mind with Russel Crowe) is a solution concept of a game involving two or more players, in which each player is assumed to know the equilibrium strategies of the other players, and no player has anything to gain by changing only his own strategy. Overall, an individual can receive no incremental benefit from changing actions, assuming other players remain constant in their strategies. So for a Nash Equilibrium to exist in the game of Collective Knowledge Construction, assuming that the optimum strategy is knowledge building and sharing, no players would change their strategy, despite knowing the actions of their opponents. And this doesn’t play out to be true. As long as we have corporate interests, consultants, publishing companies and old mindsets a Nash equilbria can never be reached. But this use may be slightly incorrect because we assume player participation. This book challenges many fundamental assumptions those of us caught up in the hype of web 2.0 make. Regardless of whether you take the time to read Lanier, and whether you agree/disagree with his thoughts, I think this is what we should be looking for: Intensity of Connection – Holding the quality of connections higher than the quantity of connections. Watch Jaron Lanier’s talk at LWF in January – Learning Through Experience & Play. Children play – its how they make sense of the world. In societies where guns are part and parcel of media and culture, children inevitably at an early age play toy guns and ‘shootouts’. In other cultures, where guns are not part of the local symbology, children play instead with toy spears or bow and arrows. The act of imaginary weapon play and violence in itself provides children a sense of power as they struggle to make sense of the world around them. In all of popular culture, from Harry Potters magic wand, to the ‘One Ring’ in Lord of the Rings, Excaliber from Arthurian Legend to destructive spells emanating from a child’s seemingly normal open hand, a single object becomes a vehicle for story and a symbol for power – this act of ‘violent’ play is important for the development of a child. From when they are born to the time they are independent, all children feel powerless to a certain extent. They struggle to learn how to walk, they are dependent on their parents for meals, and what seems easy for adults can be frustratingly difficult for children. This feeling of powerlessness can be especially amplified if the child grows up in an environment of abuse, neglect or poverty. A Grade 4 student in the school yard who is reenacting a scene from Call of Duty where he’s avatar has snuck up behind an enemy player and slit their throat with his knife, knows that what he is doing is play. The same child who with his friends pretends that he is a Wrestler from the WWE knows that he is not actually a Wrestler from the WWE. Children are using this reenactment to develop emotionally – they are reenacting a story and using it’s emotional power to aid in their development of character. Games enable children to play with certain realities and to take power over them to an extent. Gangsta Rap and movies about seriel killers are similar tools – in engaging in this culture children feel that they understand things better, and feel stronger in the face of such realities. Most adults are anxious about this type of behaviour. The cybersafety consultants who do the rounds in schools would most likely say to be vigilant in the look out for this type of behaviour. Won’t children who play guns or video games like Call of Duty become desensitised to violence and grow up thinking it’s ok to shoot people? Won’t this act of play, turn out kids who enjoy violence? These anxieties are natural. From years of experience, we know that in reality guns are bad and do lead to violence – but adults mistake play with reality – kids don’t. They have an innate sense of what is play and what is real. Children need to fantasize, and play, and lose themselves in stories. It’s how they learn. Most anxieties and fears about make-believe violence and violent video games come from ignorance, media ‘beatups’ and hyperbole or perpetrated soceitel ‘myths’ – Henry Jenkins debunks these myths about video games in his article Eight Myths About Video Games. Goals are achieved through complete commitment. Clear Choices must be made. Sometimes shattering old ways is necessary. Loss and defeat are survivable. We can feel fear – but do it anyway. Having first written about using Text-Based Adventures in education back in 2009, my interest in them as a tool for teaching programming concepts, game design, literacy and systems thinking has been renewed. Exploring Interactive Fiction (IF) design systems such as Inform7 and Adrift, I have found Quest to be probably the best for small projects ideally suited to K12 education. The desktop client is currently for PC only, but a beta Chrome Store Quest app is now available for use on any platform. There are just three rooms and three objects. The Foyer of the Opera House is where the game begins. This empty room has doors to the south and west, also an unusable exit to the north. There is nobody else around. The Bar lies south of the Foyer, and is initially unlit. Trying to do anything other than return northwards results in a warning message about disturbing things in the dark. On the wall of the Cloakroom, to the west of the Foyer, is fixed a small brass hook. Taking an inventory of possessions reveals that the player is wearing a black velvet cloak which, upon examination, is found to be light-absorbent. The player can drop the cloak on the floor of the Cloakroom or, better, put it on the hook. Returning to the Bar without the cloak reveals that the room is now lit. A message is scratched in the sawdust on the floor. The message reads either “You have won” or “You have lost”, depending on how much it was disturbed by the player while the room was dark. The act of reading the message ends the game. Competence – the game should handle the user interactions expected for a piece of interactive fiction. Immersiveness – the degree to which a player loses him or herself in the game world. Completeness – the world should have a reasonable number of room and objects. World Design – non-linear story with several puzzles to solve. Prose Quality – the room descriptions should draw the player into the game. Interactivity – the player should have interesting objects and environments to manipulate. Fun – the game should entertain the player and motivate him or her to play often. A question that educators at all levels should ask themselves is “What would you do with a computer if their was no internet access?” Using Interactive Fiction enables students to engage with game design whilst not having to worry about skill in designing digital art – and it is a great literacy workout too. One of the mini-games in Read Dead Redemption is Liar’s Dice. Liars dice is a game of incomplete information which distinguishes it from games like chess and backgammon where you can always see what your opponent is doing. The art of liars dice is filling the gaps in the incomplete information provided by your opponents bidding, and at the same time preventing your opponents from discovering any more than what you want them to know about your roll. Originating in South America and originally going by the name of Perudo, this game is inherently engaging for students. •Each player in the game, proceeding clockwise, must make consecutively higher bids or call ‘liar’. The skill of liars dice consists of knowing when to tell the truth and when to ‘bluff’ and also when to call someone’s bluff. Obviously the optimum strategy is to mix bluffing with statistical estimation of what’s on the table. Since the other players have to base their estimation of the dice on what you bid, if you can get away with a bluff in the early rounds you can affect their estimates of what’s on the table. For example, all players roll their dice. Player 1 has 3 3 4 5 2, Player 2 has 6 6 3 2 4 and Player 3 has 6 1 3 3 5. Player 1 opens the bidding and bids ‘Three Sixes’. Player 2 has two sixes himself so bids ‘Four sixes’. Player 3 also has a six and a one so bids ‘Five Sixes’. Player 1 holds no sixes so can fairly confidently call liar with the odds being in his favour. The early bluff is misleading information designed to skew the perception of the other players. When a player makes a bid that the information he has does not support, that bid is likely to be accurate based on simple probability, but other players will think the bid was made because the player had some part of the bid in his own dice. This in turn causes the other players to inflate their own bids based around that value, increasing the likelihood that those bids will be false. Once other players are aware that you like to bluff with an opening bid, it can be to your advantage to start semi-bluffing. Lets say you have the opening bid and you roll 6 6 1 3 2. Bid ‘Five Sixes’. Player 2 thinks that you are bluffing and calls you ‘liar’. The probability is definitely in your favour that Player 2 and Player 3 have each got either a one or a six. Position is one of the key elements affecting virtually every bid in liars dice. The game is heavily weighted in favour of the player acting first. Aggressiveness in this position ensures that you control the round. For example, an opening bid of ‘Three Twos’ is relatively weak and gives the other players a lot of room to move, potentially exposing yourself to a precarious situation later in the round. By demonstrating weakness on the opening bid, you have relinquished your powerful position to the next player who can then take control of the round. A much more dominating and aggressive bid might be ‘Five Fives’ or ‘Four Sixes’. An aggressive opening like this one puts pressure on the other players immediately and gives you control of the round. A complete strategy of liars dice is inherently complex because it takes into account not only the dice that each player is holding but also the state of the game in general. After experimentation you will find that certain players exhibit certain tendencies and that their are subtle differences in game play between a game involving two players and a game involving more than two. 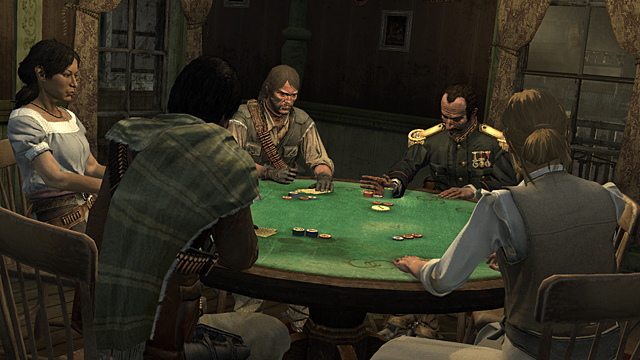 The movie, Pirates of the Caribbean: Dead Mans Chest, also gives a variation of Liars Dice (seen below) and an online version of ‘Pirates Dice’ has been created by Disney, where you get to wager your soul as you play against Davey Jones and his crew. I have provided here a brief overview of an opinion on liars dice. It is not meant to be comprehensive, but instead is provided to guide thinking when developing your own strategy and to help you guide students in their own exploration of this game.